Meadow Pointe, located just north of Hillsborough County in Pasco County on 1800 acres, is known as a family-oriented community. Half of its 1800 acres are set aside as a conservation area, so it offers residents the best of both worlds — a peaceful, quiet community that is convenient to restaurants, stores and medical facilities. Meadow Point is one of Wesley Chapel’s largest planned communities and has 8,400 single-family homes that (built or to be built), townhomes and villas in its 43 neighborhoods divided into four separate Community Development Districts. Meadow Pointe residents can also enjoy several swimming pools and community clubhouses, as well as immaculately maintained tennis, basketball and volley ball courts. The community also has two elementary schools, a middle and a high school. As a Community Development District (CDD or District), Meadow Pointe residents receive more recreational amenities and landscaping services than they would as a non-CDD. This higher level of service is funded by an assessment on each property owner’s tax bill. So residents have peace of mind knowing the community will maintains it beauty and amenities into the future. Even with this maintenance fee, many residents find that Pasco County’s low property taxes make it less than or equal to what they would pay in property taxes as a resident of Tampa/Hillsborough County. 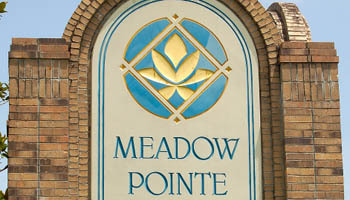 Meadow Pointe’s began in the late 1990 and homes continue to be built today. It offers easy access to the six-lane State Road 56, Interstate 75, and I-275. You’ll also find retail areas like the Shops at Wiregrass, a branch of the Pasco-Hernando State College branch, and other housing and retail developments nearby. The city of tampa is about 30 miles away. If you would like to explore this amazing planned community in Wesley Chapel, give us a call 813-431-2840. We’d love to introduce you to Meadow Pointe and help you find the home of your dreams! We’ve sold over 4800 homes in the Tampa Bay Area. Our experience, commitment, and unparalleled customer service ensures you find a home that fits you perfectly and that you have a great time during the process!